This title shall be known as the Zoning Ordinance of the City of Hood River and shall be referred to herein as "this title." This title has been designed in accordance with the goals, policies, and most appropriate statements of the intent of the City's Comprehensive Plan. It is the purpose of this title, therefore, to provide the principal means for the implementation of the Comprehensive Plan. A. No permit shall be issued by the Building Official for the construction, reconstruction, or change of use of a structure or lot that does not conform to the requirements of this title. B. A plot plan showing the proposed construction or structural alteration shall be required. The applicant shall be responsible for the accuracy of the plot plan. 3. The opinion of the City Attorney. B. Written Interpretation. If an interpretation is requested in writing, it shall be issued within fourteen (14) days after receiving the request. The interpretation becomes effective twelve (12) days after it is mailed or delivered to the requestor, unless an appeal is filed. C. Appeals. Within twelve (12) days of the mailing of the interpretation, the requestor may appeal the Zoning Ordinance interpretation to the Planning Commission per the appeals procedure outlined in Review Procedures (Chapter 17.09), with the exception that written notice of the hearing is provided only to the appellant when the request does not concern any specific property. D. Interpretations on File. The Planning Director shall keep on file a record of all Zoning Ordinance interpretations. 17.01.050 Relationship to Other Regulations. Where this title imposes a greater restriction upon the use of building or premises, the provisions of this title shall govern. 17.01.060 Definitions. As used in this title, the singular includes the plural and the masculine includes the feminine and neuter. The word "may" is discretionary, but the word "shall" is mandatory. The following words and phrases shall have the meanings given them in this section. 1. The way or means by which pedestrians and vehicles enter and leave property. 2. A way or means of approach to provide pedestrian, bicycle, or motor vehicular entrance or exit to a property. ACCESS CONNECTION means any driveway, street, turnout or other means of providing for the movement of vehicles to or from the public roadway system. ACCESS MANAGEMENT means the process of providing and managing access to land development while preserving the regional flow of traffic in terms of safety, capacity, and speed. ACCESS MANAGEMENT CLASSIFICATION SYSTEM means a ranking system for roadways used to determine the appropriate degree of access management. Factors considered include functional classification, the appropriate local government's adopted plan for the roadway, subdivision of abutting properties, and existing level of access control. ACCESSORY DWELLING UNIT means a separate dwelling unit contained within or detached from a single-family dwelling on a single lot, containing 800 square feet or less, excluding any garage area or accessory buildings, and sharing a driveway with the primary dwelling unless from an alley. A recreational vehicle is not and cannot be used as an accessory dwelling unit. ACCESSORY USE OR ACCESSORY STRUCTURE means a use or structure incidental and subordinate to the main use of the property and located on the same lot as the main one. ACCESSWAY means a walkway that provides pedestrian and bicycle passage either between streets or from a street to a building or other destination such as a school, park, or transit stop. Accessways generally include a walkway and additional land on either side of the walkway, often in the form of an easement or right-of-way, to provide clearance and separation between the walkway and adjacent uses. Accessways through parking lots are generally physically separated from adjacent vehicle parking or parallel vehicle traffic by curbs or similar devices and include landscaping, trees, and lighting. Where accessways cross driveways, they are generally raised, paved, or marked in a manner that provides convenient access for pedestrians. ALLEY means a street, which affords only a secondary means of access to the property. ALTERATION means to remove, add to, or otherwise change the physical appearance of any part or portion of the EXTERIOR of a historic landmark. 4. Contains elements of architectural design, detail, materials, or craftsmanship that represent a significant innovation. BED AND BREAKFAST FACILITY means a single-family dwelling which conducts transient rental of rooms with or without a morning meal. 1. Multi-use path means a paved ten (10) to twelve (12) foot wide way that is physically separated from motorized vehicular traffic, typically shared with pedestrians, skaters, and other non-motorized users. 2. Bike lane means a four (4) to six (6) foot wide portion of the roadway that has been designated by permanent striping and pavement markings for the exclusive use of bicycles. 3. Shoulder bikeway means the paved shoulder of a roadway that is four (4) feet or wider, typically shared with pedestrians in rural areas. 4. Shared roadway means a travel lane that is shared by bicyclists and motor vehicles. 5. Multi-use trail means an unpaved path that accommodates all-terrain bicycles, typically shared with pedestrians. BUILDING means a structure used or intended for supporting or sheltering any use or occupancy. BUILDING FACE means all the window and wall area of a building on one (1) plane. 1. The elevation of the highest adjoining sidewalk or upper ground surface within a five (5) foot horizontal distance of the exterior wall of the building when such sidewalk or ground surface is not more than ten (10) feet above the lowest grade. 2. An elevation ten (10) feet higher than the lowest grade when the sidewalk or ground surface described in item one (1) above is more than ten (10) feet above the lowest grade. The height of a stepped or terraced building is the maximum height of any segment of the building. BUILDING OFFICIAL means the officer or other designated authority charged with the administration and enforcement of the Oregon Structural Specialty Code (OSSC) or his duly authorized representative. BUILDING SITE means one or more lots or parcels grouped together to form a tract of land to be used for building one or more structures. The building site lines shall be those lines, which bound the total area, exclusive of any public dedicated street. CARETAKER'S RESIDENCE means a dwelling unit necessary for the security and/or operation requirements of an on-site industrial use. CENTER means a group of establishments planned, developed, and managed as a unit with non-segregated, off-street parking and circulation provided on the property. CHANGE OF USE means any use that substantially differs from the previous use of a building, structure, or land. Factors to consider when identifying a change of use include the effects on parking, drainage, circulation, landscaping, building arrangements, and nuisance factors including, but not limited to, traffic, lighting, and noise. CHILDCARE CENTER means the provision for child day care of thirteen (13) or more children through the age of 12 in any 24-hour period and could include a public or private school. CITY means the City of Hood River. CITY PLANNING DEPARTMENT means the department of the City that processes applications; provides professional planning advice to the Planning Commission, City, and Council; and administers the City’s zoning and subdivision ordinances and Comprehensive Plan. CITY COUNCIL means the Hood River City Council. COMMERCIAL USE means any activity involving the sale of goods or services that does not involve manufacturing, processing, warehousing, or outside storage. CONDOMINIUM UNIT means a part of the property consisting of a building or one or more rooms occupying one or more floors of a building or one or more rooms occupying one or more floors of a building or part or parts thereof, intended for any type of independent ownership, the boundaries of which are described pursuant to paragraph (c) of subsection (1) of ORS 91.509, and with a direct exit to a public street or highway to a common area or areas leading to a public street or highway. An area used for the temporary parking or storage of automobiles, boats, campers, or other similar recreational vehicles or equipment may be considered a unit even though consisting of air space only without any building or structure when such area is auxiliary to a condominium in which the remainder of the units are in or are a part of a building or buildings. CONTIGUOUS LAND means two (2) or more parcels, excluding platted subdivisions, under a single ownership which are not separated by an intervening parcel of land under a separate ownership. CROSS ACCESS means a service drive providing vehicular access between two (2) or more contiguous sites so the driver need not enter the public street system. DEMOLISH means to raze, destroy, dismantle, deface or, in any other manner, cause partial or total ruin of a designated historic landmark, individually or within a Historic District. DISTRICT means a geographic area possessing a significant concentration, linkage, continuity, or design relationship of historically significant sites, structures, landscape features, or objects unified by past events or physical development. DUPLEX means a building divided into two (2) living units. DWELLING UNIT means a single unit providing complete, independent living facilities for one (1) or more person, including permanent provisions for living, sleeping, eating, cooking, and sanitation. Buildings with more than one set of cooking facilities are considered to contain multiple dwelling units unless the additional cooking facilities are clearly accessory, such as an outdoor grill. EASEMENT means a grant of one (1) or more property rights by a property owner to or for use by the public or another person or entity. ENTITY means any use functioning independently. EXTERIOR means all outside features of a historic landmark, individually or within a historic district. FAMILY means one (1) or more persons, excluding servants, related by blood, marriage, legal adoption, or legal guardianship, occupying a single non-profit housekeeping unit and using common housekeeping facilities; a group of not more than five (5) unrelated persons living together as a single non-profit housekeeping unit and using common housekeeping facilities. FAMILY DAY CARE means care of twelve (12) or fewer children either full- or part-time, including resident family members, as accessory to any residential use. Family day care is subject to the definition of “home occupation” in this chapter. FENCE means a structure with air on both sides erected for the purpose of providing landscaping, defining an area, confinement of people or animals, protection of privacy, screening, and/or restriction of access. FENCE, SIGHT OBSCURING means a fence or planting arranged in such a way as to obscure vision. FLOOD LIGHT means a wide spectrum of non-shielded light covering a large area. GRADE has the meaning set forth in the most current version of the City of Hood River Engineering Standards adopted pursuant to Title 16. GROUP RESIDENTIAL means residential occupancy of dwelling units by groups of more than five (5) persons who are not related by blood, marriage, legal adoption or legal guardianship, and where communal kitchen and dining facilities are provided. Typical uses include the occupancy of rooming houses, cooperatives, halfway houses, and intermediate care facilities. HARD SURFACING means asphalt, concrete, grasscrete, or other similar surface that is accepted by the City engineer. HEARING BODY means the Landmarks Review Board members, Planning Commission, or City Council, as applicable. HEARING BODY MEMBERS means the Landmarks Review Board, Planning Commissioners or City Council members, as applicable. HEIGHTS BUSINESS DISTRICT, THE means the parcels in the C-1 and C-2 zones between May, Belmont, 10th, and 14th streets. HISTORIC LANDMARK means a district, corridor, ensemble, building, portions of building, site, landscape feature, cemetery, bridge, sign, plaque, archaeological site or artifact, or other objects of historical and/or architectural significance, locally, regionally, or nationally designated by the Landmarks Board and City Council under this ordinance. 4. Exemplifies the cultural, political, economic, social, or historic heritage of the community. HOME OCCUPATION means the occupation carried on by a resident of a dwelling unit as an accessory use within the dwelling unit or within an accessory building which is incidental or secondary to the residential use. HOSTED HOMESHARE means the transient rental of a portion of a dwelling while the homeowner is present. INCIDENTAL AND ESSENTIAL means a use which is subordinate and minor in significance and size to the primary use, and which has an integral relationship to the primary use. INDUSTRIAL OFFICE USE means activities that, while conducted in an office-like setting, are more compatible with industrial activities, businesses, and districts. Their operations are less service-oriented than traditional office uses and focus on the development, testing, production, product training and support, processing, packaging, or assembly of goods and products, which may include digital products. They primarily provide products to other businesses. They do not require customers or clients to visit the site; any such visits are infrequent and incidental. INDUSTRIAL USE means any activity involving the manufacture, processing, warehousing, or outside storage of products to be transported elsewhere for retail sale and is more intensive that Light Industrial uses because of noise, odor and truck traffic. JOINT ACCESS (OR SHARED ACCESS) means a driveway connecting two (2) or more contiguous sites to the public street system. LANDMARKS BOARD means the Hood River Landmarks Review Board. LIGHT INDUSTRIAL USE means industrial service (e.g. corporate laundry and cleaning, etc. ), research and development, manufacturing, processing, fabrication, packaging, assembly of goods, and warehousing. LOADING SPACE means an off-street space within a building or on the same lot with a building for the temporary parking of a commercial vehicle or truck while loading or unloading merchandise or materials, and which space has access to a street or alley. LOT means a specific tract of land within a platted subdivision. LOT AREA means the total area of the lot or parcel measured in the horizontal plane within the lot or parcel boundary lines inclusive of public easements, private roads, and the easement of access to other properties. LOT OF RECORD means a parcel or lot duly recorded by the Hood River County Department of Records and Assessments at the time of the adoption of the ordinance codified in this title. LUBA means The State of Oregon Land Use Board of Appeals. MANUFACTURED HOME means a structure constructed for movement on the public highways that has sleeping, cooking, and plumbing facilities that is intended for human occupancy, that is being used for residential purposes, and that was constructed in accordance with federal manufactured housing construction and safety standards and regulations in effect at the time of construction. MATCHING or LIKE MATERIALS means materials that duplicate the original material in size, shape, composition, and texture as closely as possible. MOBILE HOME (SINGLE WIDE) means a vehicle or structure constructed for movement on the public highways that has sleeping, cooking, and plumbing facilities; is intended for human occupancy; and is being used for residential purposes. MOBILE HOME (DOUBLE/TRIPLE/QUAD WIDE etc.) means a factory-built home that is the result of the combination of joining (at the time it is placed on the property) of two (2) or more sections, to which wheels may be attached for the purpose of moving it to a concrete foundation. MANUFACTURED DWELLING PARK means any place where four (4) or more manufactured dwellings (as defined in ORS 446.003 (26)) are located within 500 feet of one another on a lot, tract, or parcel of land under the same ownership; the primary purpose of which is to rent space, keep space for rent to any person for a charge or fee paid or to be paid for the rental or use of facilities; or to offer space free in connection with securing the trade or patronage or such person. "Manufactured dwelling park" does not include a lot or lots located within a subdivision being rented or leased for occupancy by no more than one manufactured dwelling per lot if the subdivision was approved by the municipality unit having jurisdiction under an ordinance adopted pursuant to ORS 92.010 to 92.190. MULTI-ENTITY COMPLEX means any structure within which more than one (1) entity is located or will be conducted. MULTI-FAMILY DWELLING means a building designed or used exclusively for the occupancy of four (4) or more families living independently of each other and having separate housekeeping facilities. NON-CONFORMING ACCESS FEATURES means features of the property access that existed prior to the date of ordinance adopting and do not conform to the requirements of this ordinance. NON-CONFORMING STRUCTURE OR USE means a lawful existing structure or use at the time the ordinance codified in this title, or any amendment thereto, becomes effective that does not conform to the requirements of the zone in which it is located. NON-RESIDENTIAL USE means an institutional use, public facility, or similar use in the residential (R-1, R-2, and R-3) zone. NON-TRANSIENT RENTAL means to rent a dwelling unit or room(s) for compensation on a month-to-month basis, or for a longer period. OAR means Oregon Administrative Rules. OCCUPATION means an endeavor for profit. ORS means Oregon Revised Statutes. OSSC STANDARDS means the Oregon Structural Specialty Code Standards promulgated by the International Conference of Building Officials, as amended and adopted by this jurisdiction. OWNER means the owner of record or his authorized agent. PARCEL means a tract of land that is created by a partitioning of land. PARKING SPACE means a rectangle not less than eighteen (18) feet long and nine (9) feet wide for use by a vehicle. PERSON means a natural person, firm, partnership, estate, receiver, syndicate, branch of government, or any group or combination acting as a unit. PLANNING COMMISSION means the Hood River City Planning Commission. PLANNING DIRECTOR means the director of the Planning Department or designee. PROFESSIONAL OFFICE means a use involving professional services such as medical care, consulting, legal services, and other similar services. 2. Architectural features such as cornices, eaves, canopies, sunshades, gutters, chimneys, and flues, which shall not encroach more than three (3) inches for each foot of required setback. PUBLIC FACILITY OR USE means a facility or use which is necessary for the public health, safety, and welfare; including police, fire protection, sewage collection and treatment, storm drainage systems, water distribution and treatment, public health services, public recreational programs and facilities, energy generation and distribution, telephone systems, solid waste disposal, transportation services, library services, and community government. PUBLIC PARK means an open or enclosed tract of land set apart and devoted for the purposes of recreation, ornament, light, and air for the general public. QUASI-JUDICIAL HEARING means a hearing wherein the hearing body is required to apply general standards and criteria to a specific set of facts in order to determine the conformance of the facts to the applicable criteria, which results in a determination that will directly affect a small number of identifiable persons. QUORUM means a majority of the members of the hearing body. A member who is present at the hearing but is disqualified from voting or abstains from voting shall be counted as being present for purposes of constituting a quorum of the hearing body. REASONABLE ACCESS means the minimum number of access connections, direct or indirect, necessary to provide safe access to and from the roadway, as consistent with the purpose and intent of this ordinance and any applicable plans and policies of the City of Hood River. RECREATIONAL VEHICLE means a vehicle or trailer designed for highway use that is intended or used for human occupancy to be used temporarily for recreational purposes. RESIDENTIAL DEVELOPMENT means single-family dwellings, manufactured home, duplexes, triplexes, townhouses, residential condominiums, multi-family dwellings, accessory dwelling units, group residential facilities, and similar structures. In some circumstances the use of residential development for non-residential uses may be approved. RESIDENTIAL OR RESIDENTIAL USE means the occupancy of a dwelling unit on a non-transient basis. Uses where tenancy is arranged on a transient basis are not considered residential. RESIDENTIAL CARE FACILITY means a treatment or training facility duly licensed by the State of Oregon which provides residential care alone or in conjunction with treatment or training for six (6) to fifteen (15) individuals who need not be related. Staff persons required to meet State Licensing requirements shall not be counted in the number of facility residents and need not be related to each other or the residents. REHABILITATION means the return of property to a state of utility, through repair or alteration, which makes possible an efficient contemporary use and preserves the property's historic value. RESTORATION means the process of accurately recovering the form and details of a property and its setting as they appeared at a particular historic period by means of the removal of later work or the replacement of missing earlier work. RETAINING WALL means a wall or other structure erected for the purpose of holding back or in place soil, rock, and/or other material and designed for the purpose of resisting lateral and other forces from the material being held back or in place. 1. The area between the boundary lines of an alley, easement, street, or highway. 2. Land reserved, used, or to be used for a highway, street, alley, walkway, drainage facility, or other public purpose. ROOF LINE means the ridge on a gable, peaked roof, or the parapet of fascia of a flat roof. A mansard roof is considered a gable roof for the purposes of this definition. ROOMING HOUSE means a building where the non-transient rental of lodging without meals, is provided to over five (5) people. SETBACK means a line established by ordinance beyond which a structure may not be built. A legal setback line may be a property, vision, or vehicle clearance line. SIGN means any identification, description, illustration, symbol, or device that is free-standing, affixed, painted, or bas relief upon an awning, building, structure, or land, which communicates a message or idea, or identifies, or directs attention to a product, place, activity, person, institution, or entity. SINGLE-FAMILY DWELLING means a building designed or used exclusively for the occupancy of one (1) family and having housekeeping facilities for only one (1) family. SINGLE-FAMILY DWELLING, DETACHED (Detached Single Family Dwelling) means a detached single-family dwelling unit located on its own lot. STANDING means the status of a person who has submitted oral testimony at a hearing or written testimony in conjunction with a hearing or administrative action. A person with standing shall be considered a party. STREET means the entire width between the right-of-way lines of every public way for pedestrian, bicycle, and vehicular traffic. STUB-OUT (STUB-STREET) means a portion of a street or cross access drive used as an extension to an abutting property that may be developed in the future. SUBDIVIDE LAND means the act of dividing an area or tract of land into four (4) or more lots within a calendar year, when such area or tract exists as a unit or contiguous units of land under a single ownership at the beginning of such year. SUBDIVISION means the act of subdividing land or an area or tract of land, subdivided as defined in this section. TOWNHOUSE (attached single family) means a single-family dwelling unit located on its own lot that shares one or more common or abutting walls with one or more single family dwelling units on adjacent lot(s). TOWNHOUSE BUILDING means a structure that includes two or more townhouses. TOWNHOUSE PROJECT means one or more townhouse buildings constructed on a building site where the land has been divided to reflect the townhouse property lines and the commonly owned property, if any. TRANSIENT RENTAL means to rent a dwelling unit or room(s) for compensation on less than a month-to-month basis. TRIPLEX means a building designed or used exclusively for the occupancy of three (3) families living independently of each other and having separate housekeeping facilities for each family. USE means the proposed purpose for which land or structure is designed, arranged, or intended, or for which it is occupied or maintained. VACATION HOME RENTAL means the transient rental of an entire dwelling unit. VEHICLE CLEARANCE means the triangular area formed at a corner or parcel by the intersection of a dedicated public right-of-way (improved or unimproved) and an alley, driveway, parking lot, or loading area and a straight line joining said lines through points fifteen (15) feet back from their intersection. This vehicle clearance area shall provide an area of unobstructed vision. WALKWAY means a hard-surfaced area intended and suitable for pedestrians, including sidewalks and the surfaced portions of accessways. WALL means a barrier created for the same purposes as a fence, bus excludes retaining walls. WATERFRONT FRONT means the area of the City west of the Hood River (SR-35) Bridge, north of I-84, and east of the Hook, including the Hook. YARD is an unobstructed area from the ground upwards, except as otherwise provided in this title. YARD, FRONT means a yard extending from a building to the front lot line. YARD, REAR means a yard extending from a building to the rear lot line. YARD, SIDE means a yard extending from a building to the side lot line. When a parcel has two (2) or more front yards, the remaining yards are to be considered side yards. ZONE means one of the classifications of permitted uses into which the land area of the City is divided. ZONING MAP means the official map that identifies and delineates boundaries of the City’s zoning classifications. ZONING ORDINANCE means Titles 16 and 17 of this Code. 17.02.010 Establishment and Designation of Land Use Zones. A. The boundaries of the zones established in this title are indicated on a map entitled the "City zoning map". B. The official City zoning map indicating the zone boundaries or amendments thereto shall be signed by the Mayor and City Recorder at the time of adoption. The official map shall be maintained on file by the City Recorder. C. Amendments to the official City zoning map and ordinance shall be made by the City administration within thirty (30) days after the effective date of the amendment. Due to the wide distribution of copies of this title, amendments to the zoning map or text of this title may not always be reflected in every copy. 17.02.030 Interpretation of Zone Boundaries. 1. Street lines: Where zone boundaries are indicated as approximately following the centerline or right-of-way line of streets, such lines shall be construed to be such zone boundaries. 2. 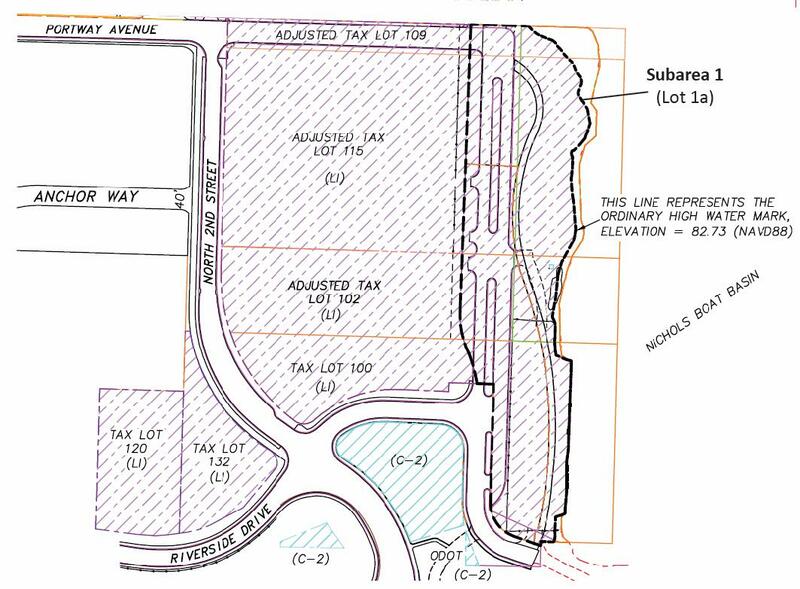 Lot lines: Individual property lines may be used to separate zoning boundaries. The zoning classification of a lot of record in which a zoning boundary divides the lot into two (2) or more zones shall be determined by the Planning Commission and the owner. 17.02.040 Zoning of Annexed Areas. 1. Minimum Lot Size: The minimum lot or parcel size shall be 7,000 square feet. a. Per dwelling, unit a minimum of 7,000 square feet. b. A minimum frontage of fifty (50) feet on a dedicated public street. c. A minimum frontage of thirty (30) feet on a public dedicated cul-de-sac. 1. No structure shall be placed closer than ten (10) feet from the nearest public right-of-way line of a dedicated public street. 2. Garages that directly face adjacent streets shall be at least twenty (20) feet from the nearest public right-of-way lines of the dedicated public streets. Garages so constructed to not face an adjacent street may be ten (10) feet from the nearest right-of-way line of the dedicated public street. Detached garages so constructed to not face an adjacent public dedicated alley may be five (5) feet from the right-of-way line. a. No structure shall be placed closer than six (6) feet from the side property line. b. Structures greater than twenty-eight (28) feet in height shall be eight (8) feet from the side property line. c. No structure shall be placed closer than ten (10) feet from the rear property line. d. Projections may not encroach more than three (3) inches for each foot of required yard setback width. E. Maximum Building Height. Thirty-five (35) feet for all uses except residential development; twenty-eight (28) feet for all residential development. 1. Individual dwelling units shall be provided with at least two (2) parking spaces on the building site, one (1) of which may be within the required front yard setback area. 2. Parking spaces utilizing access from a public dedicated alley may be located within the setback area. G. Signs. All signs shall be in conformance with the sign regulations of this title. 1. The minimum lot or parcel size shall be 5,000 square feet. 2. The minimum requirement for building sites: per detached single family dwelling unit or duplex, a minimum of 5,000 square feet. 3. A minimum frontage of fifty (50) feet on a dedicated public street. 4. A minimum frontage of thirty (30) feet on a dedicated public cul-de-sac. 5. Lot Coverage: Subject to HRMC 17.04.120. 3. Side yard/ rear yard. a. No structure shall be placed closer than five (5) feet from the side property line. 1. Each dwelling unit shall be provided with at least two (2) parking spaces on the building site, one (1) of which may be in the required front yard setback area. 4. Bicycle parking as required by 17.20.040.
b. Four (4) or more townhouses subject to HRMC 17.16 and HRMC 17.19. 2. Minimum requirement for building sites: Per detached single dwelling unit or duplex, a minimum of 5,000 square feet. Each unit thereafter shall require an additional 1,500 square feet. 1. No structure shall be placed closer than ten (10) feet from the public right-of-way line of a public dedicated street. 2. Garages that directly face adjacent streets shall be at least twenty (20) feet from the nearest public right-of-way lines of the public dedicated streets. Garages so constructed to not face an adjacent street may be ten (10) feet from the nearest right-of-way line of the dedicated public street. Detached garages so constructed to not face an adjacent public dedicated alley may be five (5) feet from the right-of-way line. c. No structure shall be placed closer than five (5) feet from the rear property line. e. Structures greater than 28 feet in height shall be ten (10) feet from the rear property line. E. Maximum Building Height. Thirty-five (35) feet for all uses except residential development; twenty-eight (28) feet for all residential development. Multi-family dwellings are permitted up to thirty-five (35) feet. All other residential development may be conditionally permitted up to thirty-five (35) feet subject to HRMC 17.06. 1. All individual dwelling units, duplexes, and triplexes shall be provided with two (2) parking spaces for each unit on the building site, one (1) of which may be within the required front yard setback area. 2. Multi-family dwellings shall be required to furnish one and one-half (1½) off-street parking spaces per dwelling unit on or adjacent to the building site. 3. Required setback areas may be utilized for off-street parking for multi-family dwellings. 4. Parking spaces utilizing access from a public dedicated alley may be located within the setback area. 6. Bicycle parking as required by HRMC 17.20.040. H. Landscaping. All landscaping shall be in conformance with the landscape standards in this title. B. Permitted Uses Subject to Site Plan Review. 1. Professional offices: The standards outlined in the R-3 zone apply. 2. Residential development or a combination of professional offices and residential development: The standards outlined in the R-3 zone apply. F. Maximum Building Height. Thirty-five (35) feet. a. One (1) off-street parking space shall be provided on the building site or adjacent to the site for each employee. In addition, adequate off-street parking shall be provided on or adjacent to the building site to meet the needs of anticipated clientele. b. In no case shall there be less than two (2) off-street parking spaces. c. The Central Business District, the Heights Business District and the Waterfront are exempt from this requirement but shall pay a fee in-lieu of parking in accordance with Chapter 17.24.
d. Parking in the Central Business District, Heights Business District and Waterfront may be satisfied by substituting all or some of the parking requirement at adjacent or nearby off-site off-street locations and/or by adjacent or nearby shared parking if the substitute parking reasonably satisfies the parking requirements of this section. If no off-street or off-site parking reasonably satisfies the parking requirements of this section, the fee in-lieu of parking shall be paid in accordance with Chapter 17.24. If less than all required parking is provided, the fee in lieu of parking shall be paid in accordance with Chapter 17.24, except that a credit shall be given for the number of spaces provided. a. All individual dwelling units, duplexes, and triplexes shall be provided with two (2) parking spaces for each unit on the building site, one (1) of which may be within the required front yard setback area. b. Multi-family dwellings shall be required to furnish one and one-half (1½) off-street parking spaces per dwelling unit on or adjacent to the building site. c. Required setback areas may be utilized for off-street parking for multi-family dwellings. d. Parking spaces utilizing access from a public dedicated alley may be located within the setback areas. H. Lighting. Artificial lighting shall be subdued and shall not shine, cause glare, or be unnecessarily bright on surrounding properties. Both interior and exterior lighting shall take into consideration the viewshed and shall be dimmed as much as possible after closing without compromising safety and security. Flood lights on poles higher than fifteen (15) feet shall not be permitted. I. Signs. All signs shall be in conformance with the sign regulations of this title. J. Landscaping. All landscaping shall be in conformance with the landscape standards in this title. 5. Multi-family dwellings for residential use, with a minimum density of 11 units/net acre. 8. Professional Office and Office Uses. 1. Residential development, excluding multi-family, subject to the following: a) shall be reviewed through the Planned Unit Development (PUD) process; b) PUD common open space criterion is not applicable; and c) shall achieve a minimum of 11 units/net acre. 2. Residential development a minimum of 11 units/acre in conjunction with commercial uses on the same lot or parcel. 8. Commercial Uses on parcels of more than 1.5 acres. 1. Residential development are prohibited unless combined with commercial uses in the same structure, i.e, must be mixed use; all such development that includes a residential component requires a conditional use permit. 2. There is no minimum required residential density in the C-2 Zone within the Waterfront Area. 3. No more than 50% of the gross floor area of any building may be devoted to residential development, and the building primary use shall be commercial, not residential. 4. No residential development is allowed on the ground floor, and no more than 50% of the ground floor may be used for parking. 5. For any residential uses approved in the C-2 Zone within the Waterfront Area, a deed restriction, in a form acceptable to the city attorney, shall be recorded with title to the residential property that precludes any residential owner, lessee or guest from objecting to normal and customary commercial, recreational or light industrial uses (including operation of the city’s wastewater treatment plant) and any impacts there from, such as noise, dust, glare, odors, hours of operation, truck traffic, parking and the like. 6. The City may impose reasonable conditions on the approval of any residential development in the C-2 Zone within the Waterfront Area to ensure compliance with these special restrictions. 1. Minimum Lot Area: None. b. Thirty (30) feet on a public dedicated cul-de-sac. 1. Front - not required. 2. Side and rear - not required except in the case where the structure is adjacent to a residential zone, in which case a three (3) foot setback is required for structures up to two (2) stories, and increased one (1) foot for each additional story above two (2) stories. 1. Thirty-five (35) feet for residential development. 2. Forty-five (45) feet for commercial use or for mixed commercial and residential development. 3. No commercial structure shall exceed a height of forty-five (45) feet. 1. One (1) off-street parking space shall be provided on the building site, or adjacent to the site for each employee. In addition, adequate off-street parking shall be provided on or adjacent to the building site to meet the needs of anticipated clientele. 2. In no case shall there be less than two (2) off-street parking spaces. 3. The Central Business District, the Heights Business District and the Waterfront are exempt from this requirement but shall pay a fee in-lieu of parking in accordance with Chapter 17.24. 4. Parking in the Central Business District, Heights Business District and Waterfront may be satisfied by substituting all or some of the parking requirement at adjacent or nearby off-site off-street locations and/or by adjacent or nearby shared parking if the substitute parking reasonably satisfies the parking requirements of this section. If no off-street or off-site parking reasonably satisfies the parking requirements of this section, the fee in-lieu of parking shall be paid in accordance with Chapter 17.24. If less than all required parking is provided, the fee in lieu of parking shall be paid in accordance with Chapter 17.24, except that a credit shall be given for the number of spaces provided. e. Off-street loading facilities shall be encouraged. Public alleys may be utilized for off-street loading facilities. 7. Bicycle parking as required by 17.20.040. I. Lighting. Artificial lighting shall be subdued and shall not shine, cause glare, or be unnecessarily bright on surrounding properties. Both interior and exterior lighting shall take into consideration the viewshed and shall be dimmed as much as possible after closing without compromising safety and security. Flood lights on poles higher than fifteen (15) feet shall not be permitted. J. Signs. All signs shall be in conformance with the sign regulations in this title. K. Landscaping. All landscaping shall be in conformance with the landscaping standards in this title. 1. Any use, or portion thereof, causing noise shall be performed in such a manner as not to create a nuisance or hazard on any adjacent property. 2. Any use, or portion thereof, causing vibration shall be performed in such a manner as not to create a nuisance or hazard on adjacent property. 3. Any operation producing intense heat or glare shall be performed in such a manner as not to create a nuisance or hazard on adjacent property. 4. There shall be no emission of odorous, toxic, noxious matter, or dust in such quantities as to be readily detectable at any point along or outside property lines so as to produce a public nuisance or hazard. 5. If the retail and industrial uses are housed in separate buildings on the site, the industrial building shall be equal to or less in size to the commercial building. a. Major renovations are considered any activity on the exterior of a building that exceeds ten percent (10%) of the structure’s cost or fair market value or $75,000, whichever is more, as determined by the building official. b. The building entrance shall be oriented toward the primary street, whenever physically possible. c. Off-street parking or driveways shall not be placed between the building and the primary street, whenever physically possible. d. The retail storefront shall utilize regularly spaced and similarly shaped windows with window hoods or trim. e. The retail storefront shall have large display windows on the ground floor and shall be framed by bulkheads, piers, and a storefront cornice. f. For properties located within the Downtown Local Historic District, refer to the District’s Design Guidelines. 1. Buildings shall have an entrance for pedestrians directly from the street to the building interior. This entrance shall be designed to be attractive and functional and shall be open to the public during all business hours. Public sidewalks shall be provided adjacent to a public street along the entire street frontage. 2. Building facades greater than one hundred (100) feet in length shall have offsets, jogs, or other architectural distinctive changes. 3. Any wall which is within thirty (30) feet of the street, plaza, or other public open space shall contain at least twenty percent (20%) of the wall area facing the street in display areas, windows, or doorways. Windows must allow views into working areas or lobbies, pedestrian entrances, or display areas. Blank walls within thirty (30) feet of the street are prohibited. Up to forty percent (40%) of the length of the building perimeter, with the exception of the side facing the street, is exempt from this standard if facing toward loading or service areas. 4. A building shall be setback not more than twenty (20) feet from a public sidewalk unless the area is used for pedestrian activities such as plazas or outside eating areas. If more than one structure is proposed for a site, at least twenty-five percent (25%) of the aggregate building frontage shall be within twenty (20) feet of the sidewalk. 5. Developments shall divide large building masses into heights and sizes that relate to human scale by incorporating changes in building mass or direction, sheltering roofs, a distinct pattern of divisions on surfaces, windows, trees, and small scale lighting. 6. One street tree chosen from the street tree list shall be placed along the perimeter of the parcel fronting the street for each thirty (30) feet of frontage for that portion of the development facing the street. 7. Landscaping shall be designed so that fifty percent (50%) coverage occurs after one year from the date the certificate of occupancy is issued and ninety percent (90%) landscaping coverage occurs after five (5) years from the date the certificate of occupancy is issued. 8. Parking areas shall be shaded on the interior and exterior by deciduous trees, buffered from adjacent non-residential uses, and screened from residential uses. The appearance of a “sea of asphalt” shall be avoided. 9. A ratio of one (1) tree for each seven (7) parking spaces shall be required to create a canopy effect. The trees shall be an appropriate large, canopied shade tree and/or a conifer. 10. Landscaped areas shall be substantially evenly distributed throughout the parking area and parking perimeter. 1. Temporary uses not exceeding thirty (30) days. 2. Caretaker’s residence for an on-site industrial use. 3. Transportation Facilities pursuant to 17.20.050 (A). 2. Industrial Office uses up to 25,000 square feet of gross floor area. 3. Sales and display of products provided: (i) sales are limited to those accessory and essential to the permitted use; and (ii) the total area devoted to sale and display of such products shall not exceed 2,500 square feet or 25% of the gross floor area within the building, whichever is less, except for LI uses in the Central Business District where the sales and display of products can be greater than 2,500 square feet or 25% of the gross floor area as long as the use remains incidental to the onsite light industrial use. 1. Industrial Office uses greater than 25,000 square feet of gross floor area, subject to design standards in 17.16.055.
a. Location. Employee service areas shall be located within the building(s) of the permitted Light Industrial Use. b. Visibility. An employee service area may be located on a street frontage with interior access and no direct exterior entrance. Secondary fire egress is allowed. c. Signage. No exterior signs promoting employee service and sales are allowed. 3. Public facilities and uses, including change of use. 4. Light Industrial and Industrial Office Uses on parcels of more than 5 acres. 5. Off-street loading facilities shall be encouraged. a. Public alleys may be utilized for off-street loading facilities. 2. Commercial uses incidental and essential to an on-site industrial use, as defined in this title. 4. Parking lots of four (4) or more spaces, new or expanded, and or the equivalent of paving equal to four (4) or more parking spaces. 17.03.080 Open Space/Public Facility Zone (OS/PF). The purpose of the Open Space/Public Facilities Zone is to provide land areas for parks and other necessary public facilities. This zone is also intended to serve as the mechanism to implement the public parks land use designation of the Comprehensive Plan. Permitted uses not subject to site plan review in this zone shall include, but are not limited to: recreational activities, non-profit community activities, and arts festivals. That portion of Wells Island located within the City of Hood River and designated Open Space/Public Facilities is owned by the National Forest Service, and located within the Columbia River Gorge National Scenic Area. The City will not issue permits for future use of that portion of Wells Island within the City limits, which would be inconsistent with the National Scenic Area Management Plan. A. Permitted Uses Subject to Site Plan Review. 1. Public parks, playgrounds, temporary concessions incidental to and serving park/recreation user, swimming pools, and tennis courts. 2. Municipal and governmental services and functions. 1. No structure shall be placed closer than ten (10) feet from the public right-of-way line of a dedicated public street. 2. Side yard/rear yard: No structure shall be placed closer than ten (10) feet from the property lines for one- (1) and two- (2) story structures, and for structures more than two- (2) stories in height, the minimum yard is increased one (1) foot for each additional story. 3. Projections may not encroach more than two (2) inches for each foot of required yard setback width. D. Maximum Building Height. Forty-five (45) feet. a. One (1) off-street parking space shall be provided on the building site or adjacent to the site for each permanent employee. b. Adequate off-street parking shall be provided on or adjacent to the building site to meet the needs of the proposed use. 3. Bicycle parking as required by 17.20.040. F. Signs. All signs shall be in conformance with the sign regulations in this title. G. Landscaping. All landscaping shall be in conformance with the landscape standards in this title. 17.03.090 Environmental Hazard Zone (EH). The Environmental Hazard Zone is an overlay zone that designates areas that may be hazardous to develop. 1. Those which are allowed in the underlying zone designation provided the proposed development has been reviewed and stamped by a competent registered professional engineer or architect. All requirements and standards for the underlying zone designation shall be met. In addition, lands that are determined to be unsuitable to develop may be used for computation of density allowances. 2. Areas designated as flood hazard areas by the Federal Emergency Management Agency (FEMA) may be developed only in accord with the U.S. Department of Housing and Urban Development standards for flood hazard areas. 17.03.110 Columbia River Recreational/Commercial Zone (RC). 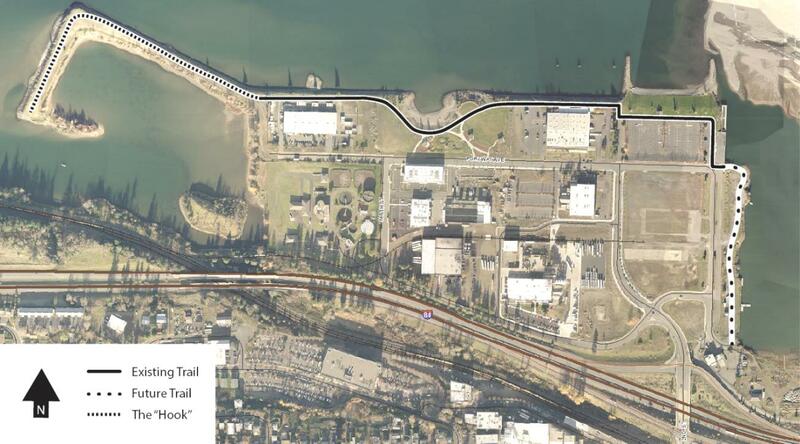 The purpose of this zone is to provide an area within the City to promote recreational Columbia River waterfront uses and limited accessory commercial activities. The zone is intended to increase and protect public access, including visual access, to the Columbia River waterfront and related recreational opportunities and to contribute to an aesthetically pleasing urban environment. The uses permitted in this zone are intended to be consistent with visual and pedestrian access. As used in this section, the Spit and Hook refer to the areas shown on Attachment “A." 1. All applicable provisions of the Hood River Municipal Code. 5. Lighting must be directed away from adjoining properties. D. Lot Coverage and Maximum Building Height. 1. Except as provided in subsection (2), there are no lot coverage requirements and the maximum building height is twenty-eight (28) feet. E. Public Access. Public access to the waterfront and recreational areas from streets, pedestrian and bike paths, and public dedicated rights of way must be provided. Each public access shall be a minimum of fifty (50) feet wide. The distance between each access shall not exceed 500 feet and shall be designed to encourage public access to the waterfront. 2. Side Yard Setback: Ten (10) feet. 3. River: Except for structures and parking lots associated with those uses permitted in subsection (A) above, no structure or parking lot shall be placed within seventy-five (75) feet from the Columbia River top of bank, as defined in this Title, except on the Spit and Hook. The distance from structures and parking lots shall be an average of at least 100 feet from the top of bank, except on the Spit and Hook. Noncommercial accessory structures related to recreational uses may be allowed within the public access in subsection (E) above and setback area created by this subsection (benches, landscaping, bleachers, picnic areas, temporary concessions, restrooms, etc.). 1. Commercial/Retail and Tourist Related Uses: One (1) space for each 300 square feet of gross floor area. 2. Drinking and eating establishments: One (1) space for each 200 square feet of gross floor area, including any outside seating areas, up to 5000 square feet, and one (1) space for each 300 square feet of gross building area in excess of 5000 square feet. H. Signs. All signs shall be in conformance with the sign regulations in this title. I. Landscaping. Except with respect to the Spit and Hook and permitted uses in subsection (A), the Landscaping and Development Standards (chapter 17.17) and the following criteria apply in this zone. As used in this subsection, the term “site” means the area shown on a site plan that depicts the location of impact on a parcel of land that also contains all of the information required by Titles 16 and 17.
a. The site conditions do not support the extent of landscaping required. Site conditions may include soils, rocks, wind exposure, limited site availability, and other similar conditions. b. It is impractical to provide and maintain the extent of landscaping required. 2. Landscaping shall be consistent with the intent and purpose of this zone and contribute to an aesthetically pleasing environment. 3. Landscaping shall reduce the visual impacts of buildings and paved areas. 4. Parking areas shall be shaded by trees with adequate screening and buffering from adjacent uses. Trees shall be planted at a minimum of one (1) tree not less than six (6) feet in height each twenty (20) lineal feet (or an equivalent thereof) along the perimeter of the parking area. 5. Trees shall be used as wind breaks when appropriate. J. Parking Areas and Roads. 1. Parking areas for four or more automobiles or trucks shall meet the standards of this section and are not required to comply with section 17.04.060 or chapter 17.17, or unless the parking area was in use prior to March 1, 2007. All new parking areas shall contain parking spaces no smaller than 20’ X 10’ and shall be graveled or covered with surface material allowed for roads in this zone. Existing unimproved parking areas may remain unimproved unless improvement is required as a condition of approval of subsequent development. 2. Roads may be paved or unpaved. Unpaved roads must be covered with gravel or other surface material applied uniformly so that the surface is stabilized and dust emission and erosion is reduced. Surface material must be ½” to 1” in diameter. Surface material and size other than as specified in this subsection may be used if approved by the City Engineer. 3. Non-toxic and/or organic stabilizers may be used to suppress dust on roads and parking areas, provided the stabilizer meets all specifications, criteria, and tests required by federal, state and local law, rule or regulation, and is not prohibited for use by any applicable law, rule or regulation. Written approval of the City Engineer is required prior to applying a stabilizer. The owner of the property to which the stabilizer is being applied shall compile and maintain records showing the brand name of the stabilizer used, the amount applied, the extent of coverage, and the date(s) of application. The property owner shall keep the records and make them readily available to the City Engineer upon request. The purpose of the IAMP Overlay Zone is the long-range preservation of operational efficiency and safety of the highway interchanges within the City of Hood River, which provides access from and to Interstate 84 for residents and businesses throughout the city. The interchanges are a vital transportation link for regional travel and freight movement and provide connectivity between the east and west side of the community and to employment and recreational opportunities at the waterfront. Preserving capacity and ensuring the safety of these interchanges and the local transportation systems in their vicinity is essential to visitors, residences, and existing businesses as well as to the continued economic vitality along the Columbia River and to community growth and development in the vicinity of the interchanges. The boundary of the IAMP Overlay Zone is shown on the City of Hood River Zoning Map and also is depicted in the respective IAMP documents. The zone’s boundary generally corresponds with a 1/2 –mile buffer area around the interstate highway interchanges. The Overlay Zone is applied to two boundary areas - one centered at Exit 62 and the other encompassing both Exit 63 and Exit 64. The provisions of this section shall apply to any Administrative, Quasi-judicial, or Legislative land use application pursuant to Section 17.09 that is for a parcel wholly or partially within the IAMP Overlay Zone, as defined by Section 17.03.120.A. Any conflict between the standards of the IAMP Overlay Zone and those contained within other chapters of the Zoning Ordinance shall be resolved in favor of this chapter and the applicable requirements in Chapter 17.20, Transportation Circulation and Access Management. Uses allowed in the underlying zoning district are allowed subject to other applicable provisions in the Zoning Ordinance and in Title 16, Subdivision Ordinance. This Section applies to all Comprehensive Plan Map and Zoning Map amendments to parcels wholly or partially within the IAMP Overlay Zone and code amendments that affect development within the IAMP Overlay Zone. In addition to meeting the requirements of Section 17.08.020, applications for Comprehensive Plan amendments, Zoning Map amendments, or development regulation amendments shall meet the requirements of the Transportation Planning Rule, Oregon Administrative Rule (OAR) 660-012-0060, including making a determination whether or not the proposed change will significantly affect an existing or planned transportation facility. The IAMP document must be reviewed and possibly updated in association with a proposed change to the Hood River Comprehensive Plan, Plan Map, or implementing zoning ordinances that will have a “significant affect” on one or more I-84 Interchanges pursuant to OAR 660-12-0060. 1. An IAMP update is required when the findings and conclusions from an IAMP review demonstrate the need for an update to the plan in order to mitigate identified impacts to interchange facilities. The agency or person(s) proposing the change shall be responsible for reviewing and initiating an update to the applicable IAMP(s), consistent with the procedures outlined in the IAMP. 2. An updated IAMP that results from a City-initiated review process pursuant to Section 17.03.120.E, shall be legislatively adopted, requiring a City Council public hearing, as an amendment to the City of Hood River Transportation System Plan and also will be adopted by the Oregon Transportation Commission as an update to the Oregon Highway Plan. The purpose of the Waterfront Overlay Zone is to: implement a design concept for the west side of the Nichols Basin in order to create an active recreational area with recreational facilities and some limited commercial development within the Light Industrial (LI) zone; establish urban design standards for new industrial and commercial development within the Overlay Zone consistent with the character of the Port and the City of Hood River to ensure an attractive and pedestrian friendly street character; and improve local access and visibility to and along the waterfront by protecting public access to the Waterfront Trail. 6. All lots/parcels between North 2nd Street and the Nichols Boat Basin including 3N10E25 Tax Lots 102, 109, 115 and 133. The boundary of the Waterfront Overlay Zone is shown on the City of Hood River Zoning Map and also is depicted in Figure 17.03.130-1, below. 1. Subarea 1. The boundary of Subarea 1 is depicted in Figure 17.03.130-2. 2. Subarea 2. The boundary of Subarea 2 is depicted in Figure 17.03.130-3. 3. Subarea 3 and Subarea 4. 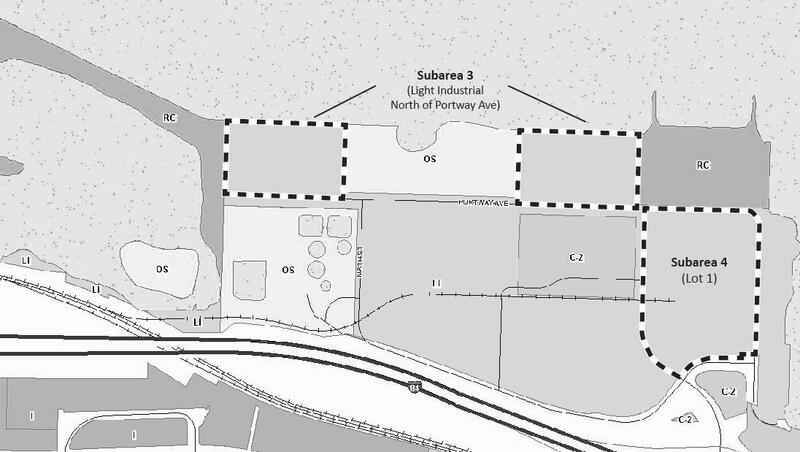 The boundaries of Subarea 3 (Industrial land north of Portway Avenue) and Subarea 4 are depicted in Figure 17.03.130-4. The provisions of this section shall apply to any land use application pursuant to Section 17.09 that is for a parcel within the Waterfront Overlay Zone, as defined by Section 17.03.130.A. Any conflict between the standards of the Waterfront Overlay Zone and those contained within other chapters of the Zoning Ordinance shall be resolved in favor of this chapter. Except as modified below, uses allowed in the underlying zoning districts are allowed within the Waterfront Overlay Zone subject to applicable provisions in the Zoning Ordinance and in Title 16, Subdivision Ordinance. a. Commercial drive-through uses and facilities are not allowed within the Waterfront Overlay Zone. i. Launch sites for non-motorized water sports. ii. Transient vending carts subject to the size limitations in 17.03.130.D.2.d, below. iv. Non-motorized water sport schools and rentals, excluding any permanent structures, provided that temporary structures are subject to the size limitations in 17.03.130.D.2.d, below. i. Commercial retail uses, including the provision of goods and/or services for sale to the public, which are not accessory and essential to a permitted light industrial use provided (a) the size limitation in 17.03.130.D.2.d, below, is met; and (b) over-night lodging facilities are prohibited. iii. Public Facilities limited to restrooms, lockers, showers, storage and related facilities owned and utilized by a non-profit or public entity to facilitate public recreational use of non-motorized watercraft. All other Public Facilities require conditional use approval in accordance with Section 17.03.060(C). c. Restriction on Light Industrial Uses. Within the area identified as Subarea 1 on Figure 17.03.130-2, commercial and industrial uses permitted or conditionally allowed by the underlying Light Industrial zone are subject to the size limitation in 17.03.130.D.2.d, below. d. Size limitation for commercial and light industrial uses. The total commercial and industrial floor area, including but not limited to buildings, private patios and decks, within Subarea 1 shall not exceed 7,000 square feet. The exterior dimensions of transient vending carts and other temporary structures shall be included in this calculation. i. Commercial retail uses, including the provision of goods and/or services for sale to the public, which are not accessory and essential to a permitted light industrial use provided: (a) commercial retail uses which are not accessory and essential to a permitted light industrial use shall not exceed 1,500 square feet or 10% of the gross floor area within the building, whichever is less; and (b) in no case shall the total commercial retail square footage in the building (accessory to industrial and non-accessory) exceed 2,500 square feet or 25% of the gross floor area within the building, whichever is less. ii. Professional Office uses which are not accessory and essential to a permitted light industrial use provided: (a) they do not exceed 25% of the gross floor area within the building; and (b) that those Professional Office uses which provide personal services, including but not limited to hair, tanning or personal care salons, massage therapy, medical, dental or chiropractic offices, shall be classified as Commercial Retail Uses subject to 17.03.130.D.3.a.i for the purposes of this section. E. Development and Design Standards for Commercial and Industrial Development. In addition to the standards of the base zone and the Site Plan Review criteria, the design standards of this section shall apply to all industrial and commercial development within the Waterfront Overlay Zone. Buildings and developments in existence on January 22, 2015, are not subject to these standards and shall not be made non-conforming by their adoption provided that any remodel, addition or new construction, which requires Site Plan Review, complies with the applicable standards. 1. Façade Variation. All buildings shall incorporate design features. Design features include offsets, balconies, projections, window reveals, or other similar elements to preclude large expanses of uninterrupted building surfaces in areas which are visible to the public. Design features shall occur at a minimum of every thirty (30) feet for all building facades within thirty (30) feet of the street, plaza, or other public open space within the Waterfront Overlay Zone; and a minimum of every fifty (50) feet for other facades which are visible to the public from a street, plaza, or other public open space within the Waterfront Overlay Zone. d. Natural wood, weathering steel trim/accents with a minimum dimension of four (4) feet by six (6) feet. e. Other similar façade variations approved by the review authority (planning staff or planning commission). 2. In order to avoid façade variations that are out of scale with the building, on buildings that are less than 3,000 square feet, the minimum dimensions (e.g., depth and width) of the features described in a – d, above, may be reduced by up to 50%. a. Any facade which is within thirty (30) feet of the street, plaza, or other public open space within the Waterfront Overlay Zone shall contain at least the minimum percentage of windows specified in Table 17.03.130-1, below. For buildings in which all facades are within thirty (30) feet of the street, plaza, or other publicly accessible open space, the percentage of windows required by Table 17.03.130-1 may be reduced by 50% on two of the four sides. b. For all other facades which are visible to the public from a street, plaza, or other publicly accessible open space at least 15% of the façade shall contain windows. c. Windows must allow views into ground floor working areas or lobbies, pedestrian entrances, or display areas. d. Windows should be square or rectangular with multiple lights. Windows with applied muntins which have no profile, or smoked glass or mirrored glass are prohibited. 4. Building Entries. The primary entrance shall be highlighted with architectural features (e.g. windows, recesses, canopies, etc.) and shall have an awning or other protection from natural elements. a. Brick, natural stone (e.g. basalt), split- and ground-faced concrete masonry units, tilt-up concrete (concrete form liner w/color-integral or stain) or a combination of these materials may be used as primary or accent materials. b. Glass (other than smoked glass or mirrored glass) may be used as primary or accent material. c. Wood may be used for soffits, overhangs, entrance canopies and as an accent material. d. Metal (e.g., weather steel) may be used for roofs and as an accent material. e. Other similar materials that are approved by the review authority (planning staff or planning commission) may be used as primary or accent materials. 6. Building Placement and Orientation. Except as provided in this section, buildings shall have their orientation toward the street rather than the parking area, whenever physically possible. a. All buildings in Subarea 2 shall have a primary entrance oriented to a street. For purposes of this subsection, “Oriented to a street” means that the building entrance faces the street. Buildings shall have an entrance for pedestrians directly from the street to the building interior. Building entrances may include entrances to individual units, lobby entrances, entrances oriented to pedestrian plazas, or breezeway/courtyard entrances (i.e., to a cluster of units or commercial spaces). Other buildings within the Waterfront Overlay should meet this standard to the extent practicable. b. Publicly accessible sidewalks shall be provided adjacent to public or private street along the entire street frontage. c. A building shall be setback not more than twenty (20) feet from a public sidewalk. This standard is met when a minimum of fifty percent (50%) of the front (street-facing) building elevation is placed no more than twenty (20) feet back from the sidewalk of a public or private street, whichever is applicable. The setback may be increased to allow for usable public space(s) with pedestrian amenities (e.g., extra-wide sidewalk, plaza, pocket park). d. Parking is prohibited between the front elevation of the building and the street. 7. Parking Regulations for Commercial and Recreational Uses in the Light Industrial Zone. The following parking standards apply to commercial and recreational uses. All other uses are subject to the standards of the base zone. a. Commercial/Retail Uses: One (1) space for each 300 square feet of gross floor area. b. Drinking and eating establishments: One (1) space for each 200 square feet of gross floor area, including any outside seating areas. c. Open space, trails, parks and similar uses: No minimum number of parking spaces is required. d. Bicycle parking as required by 17.20.040. F. Development and Design Standards for Subarea 1. In addition to the standards in 17.03.130.E, the following standards apply to Subarea 1 as identified on Figure 17.03.130-2. Any conflict between the standards of the 17.03.130.E and those contained within this subsection shall be resolved in favor of this subsection. 1. Total Square Footage: The total building floor area within Subarea 1 shall not exceed 16,000 square feet. a. Commercial and industrial buildings and off-street parking are prohibited in the northernmost 250 feet of Subarea 1 east of North First Street as measured from the northern boundary of Subarea 1 and as shown on Figure 17.03.130-6.
b. Within the remainder of Subarea 1, buildings shall occupy no more than 50% of the street frontage of North First Street and Riverside Drive. 3. Maximum Building Height. Twenty-four (24) feet as measured from the highest elevation of North First Street adjacent to the building. 4. Public Access. Public access to the waterfront and recreational areas from streets, pedestrian and bike paths, and public dedicated rights of way must be provided. Each public access shall be a minimum of fifty (50) feet wide. The distance between each access shall not exceed 360 feet and shall be designed to encourage public access to the waterfront and Waterfront Trail. 5. Esplanade. A publicly accessible esplanade with a minimum width of 10 feet shall be provided adjacent to the top of the upper bank as shown on Figure 17.03.130-6. No buildings are permitted between the esplanade and the top of the upper bank. 6. Open Space. All undeveloped areas shall be improved with landscaping, open space amenities (including hardscape), or retained with native vegetation. 7. Minimum and Maximum Setbacks. No minimum setback is required. The maximum setback shall be ten (10) feet. This standard is met when a minimum of fifty percent (50%) of the front building elevation is placed no more than ten (10) feet back from the sidewalk of a public or private street, whichever is applicable. The setback may be increased to allow for usable public space(s) with pedestrian amenities (e.g., extra-wide sidewalk, plaza, pocket park, outdoor dining area, or town square with seating). a. Required parking may be provided on adjoining parcels provided if it is within 1,000 feet of the proposed use. b. Credit for On-Street Parking: On-street parking spaces may be counted toward required parking where angled on-street parking is constructed as a part of the development. c. No parking or vehicular circulation is permitted between a building and the sidewalk or the building and the Waterfront Trail. d. Off-street parking areas in Subarea 1 shall be surfaced with pavers or other comparable decorative and permeable materials. G. Development Standards for Subarea 3 and Subarea 4. In addition to the standards in 17.03.130.E, the following standards apply to Subarea 3 and Subarea 4 as identified on Figure 17.03.130-4. 1. Maximum Building Height on Subarea 3. The maximum building height within the area designated as Subarea 3 on Figure 17.03.130-4 is twenty-eight (28) feet. a. Outdoor storage of industrial materials and shipping containers and the parking of commercial trucks and heavy equipment is prohibited. b. Fences shall not exceed three (3) feet in height. c. The Waterfront Trail shall be landscaped with a variety of trees, shrubbery and groundcover at least twenty (20) feet landward of the edge of the trail. 3. Maximum Building Footprint on Subarea 3 and Subarea 4. 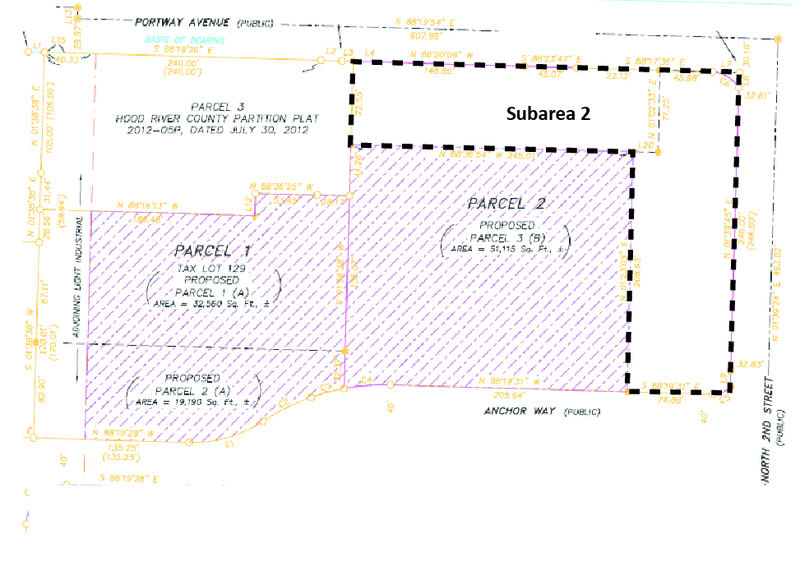 The maximum building footprint within the areas designated as Subarea 3 and Subarea 4 on Figure 17.03.130-4 is 25,000 square feet. H. Street Trees, Landscaping and Fencing. In addition to the standards of Chapter 17.17, the following street tree and landscaping standards shall apply to development within the Waterfront Overlay Zone. 1. One street tree chosen from the City’s street tree list shall be placed along the perimeter of the site or parcel fronting the street for each thirty (30) feet of frontage for that portion of the development facing the street. 2. Parking areas shall be shaded on the interior and exterior by deciduous trees and buffered from adjacent uses. A ratio of one (1) tree for each seven (7) parking spaces shall be required to create a canopy and windbreak effect. The tree species shall be selected from a street tree list provided by the City. Landscaped areas shall be fairly evenly distributed throughout the parking area and parking perimeter at the required ratio, but can be grouped around the perimeter to reduce the total area of the parking lot. The number of street trees and parking area trees shall be calculated separately. a. Emphasize the use of native trees, shrubs, or other plants adapted for survival or growth in this area. Shrubs and/or living groundcover shall be planted to assure fifty percent (50%) coverage within one (1) year and ninety percent (90%) coverage within five (5) years. b. Provide for the planting of trees as windbreaks. c. Include street trees and parking area trees that are in scale with the development. d. The tree species selected shall be selected from a street tree list provided by the City, or as otherwise approved by the City. 4. Chain link fences shall include a top rail for security and maintenance and shall have a black, dark brown, or dark green powder coating and shall have a minimum of three (3) feet of landscaped screening along street frontages. Concertina wire, razor wire, barbed wire and similar materials are prohibited. 1. Light fixtures shall be full-cutoff. When installed, a full-cutoff fixture gives no emission of light above a horizontal plane. 2. Pole-mounted lighting shall not exceed a height of 20 feet. 3. Façade lighting shall be limited to illumination from building-mounted fixtures. Up-lighting is not permitted. When installed, up-lighting emits light above a horizontal plane. 4. Pedestrian scale lighting is required for the public walkways, plazas, and courtyards. Pedestrian-scaled lighting includes “classic street lights” which are specified in the City of Hood River Transportation System Plan, bollard lights and similarly scaled fixtures. 5. Street lights shall be provided on all public streets and private streets with public access. “Classic street lights” as specified in the City of Hood River Transportation System Plan are required unless an alternative is approved by the City Engineer. Spacing of lighting shall be consistent with City of Hood River Engineering Standards unless an alternative is approved by the City Engineer. 1. All exterior storage, recycling, garbage cans, and garbage collection areas shall be screened from view from the Waterfront Trail, public plazas and open space, streets, sidewalks, and any adjacent properties. Trash and recycling receptacles for pedestrian use are exempt. 2. All truck loading areas shall be screened from view from the Waterfront Trail, streets, and sidewalks to the extent feasible. a. Rooftop mechanical equipment screens shall be required at a height that is as high as the rooftop equipment being screened. b. Screening shall be provided in a manner that is architecturally integral to the overall appearance of the building. c. Required rooftop screening of mechanical equipment (not including silos or other storage facilities) up to six (6) feet in height shall not be included in the calculation of building height provided it is the minimum size necessary to screen the equipment and does not exceed the height of the equipment by more than one (1) foot. Equipment over six (6) in height shall be screened; however, the additional height over six (6) feet shall be included in the calculation of building height. d. Solar panels are exempt from the screening requirements, above. K. Design Standards for Waterfront Trail Improvements. The following standards apply to the Waterfront Trail as shown on Figure 17.03.130-7. 1. Public access shall be provided paralleling the waterfront and around the waterfront area via the Waterfront Trail as shown on Figure 17.03.130-7 and as provided in this section. 2. The Waterfront Trail shall be open to the public in accordance with rules and regulations established by the City and the Port. 3. Where a subject parcel includes a portion of a Waterfront Trail, as shown on Figure 17.03.130-7, the layout, location, and construction of the Waterfront Trail shall be reviewed for approval as part of the site plan review. a. The Waterfront Trail shall be a minimum of (10) feet wide except along the area identified as the “Hook” on Figure 17.03.130-7 and in other locations where natural resource impacts preclude development of the full width. In no case shall the width be reduced below eight (8) feet. b. The Waterfront Trail shall be constructed of an all-weather material (e.g., asphalt or concrete, preferably concrete). c. Pedestrian scale (e.g., bollard lights) night lighting shall be provided along the Waterfront Trail. d. The Waterfront Trail shall be Americans with Disabilities (ADA) accessible. e. Seating shall be provided at periodic intervals. f. Except for the area identified as the “Hook” on Figure 17.03.130-7, the Waterfront Trail shall be landscaped. This should include a variety of trees, shrubbery, and groundcover at least eight (8) feet wide on the landward side where possible. 5. The Waterfront Trail shall be located substantially as shown on Figure 17.03.130-7, although the exact location of the Waterfront Trail may vary from Figure 17.03.130-7. Safety considerations for Waterfront Trail users shall be a principal consideration in the siting and configuration of the Waterfront Trail. 6. The Waterfront Trail may be public or private. 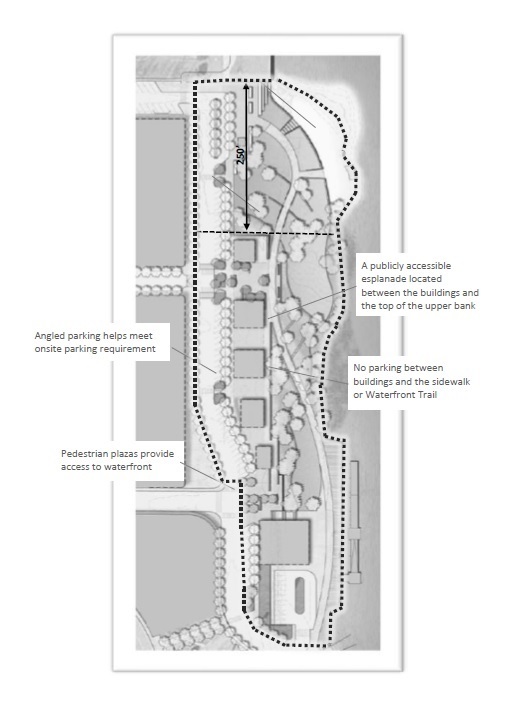 If the proposed portion of the Waterfront Trail is private, a recorded easement in a form approved by the City must be provided, and the Waterfront Trail must be open to the public and shall not be restricted to public access except as allowed by City and Port rules and regulations pursuant. All signs shall be in conformance with the sign regulations of Title 18. M. Adjustments to the Standards. 2. The alternative design better complies with the purpose and intent of the Overlay Zone to establish urban design standards for new industrial and commercial development consistent with the character of the Port and the City of Hood River; to ensure an attractive and pedestrian friendly street character; and to improve local access and visibility to and along the waterfront by protecting public access to the Waterfront Trail. The variance shall be processed in accordance with the procedures, but not the approval criteria, in Chapter 17.18. 17.04.010 Maintenance of Minimum Ordinance Requirements. No lot area, yard, or other open space existing on or after the effective date of the ordinance codified in this title shall be reduced below the minimum required for it by this title. No lot area, yard, or other open space that is required by this title for one (1) use, shall be used as the required lot area, yard, or other open space for another use. Every lot or parcel shall have access on a street other than an alley, for at least twenty (20) feet of width. A. In the R-1, R-2, R-3 and C-1 zones, accessory structures used for non-business purposes that are less than 10-feet tall and have a footprint less than 100-square feet in gross area (i.e. exterior dimensions) may encroach into the side and rear-yard setback areas of the underlying zoning district but shall be located no less than three (3) feet from side and rear property lines (including eaves and other projections). 17.04.040 General Exceptions to Building Height Limitations. Vertical projections such as chimneys, spires, domes, towers, aerials, flagpoles, and similar objects not used for human occupancy are not subject to the building height limitations of this title. A. Fences and walls not more than six (6) feet in height are permitted within or on all property lines and on corner lots or parcels when vision clearance requirements are met. B. Height is measured from original ground elevation in accordance with the City Engineering Standards. C. A fence that is six (6) feet or less as measured from original ground elevation in accordance with City Engineering Standards, is not considered a structure for purposes of setbacks established in this title. D. All retaining walls are considered structures from purposes of setbacks, and may not be located within the front, side or rear setback for a building except as provided in this title. A. Retaining walls less than four (4) feet in height are permitted within or on all setback lines when the retaining wall retains earth on the parcel on which the retaining wall is built. B. If more than one retaining wall is located within the setback, the distance between each wall must be equal to the height of both walls, and the area between the walls must be landscaped. C. There shall be no more than 4’ of exposed wall face on a retaining wall within a setback adjacent to a public right-of-way. D. One retaining wall of any height may be located within or on all property lines if the wall retains earth on the adjoining parcel and, if on a corner lot or parcel, when vision clearance requirements are met. E. Height is measured from original ground elevation in accordance with the City Engineering Standards. F. The limitations on location and height of retaining walls in this title do not apply to retaining walls located within the public right of way for the purpose of constructing or maintaining the public right of way. 17.04.070 General Exceptions to Lot Area Requirements. Lots of record existing as of December 1999 that are less than the required lot area and or have less than the required frontage specified in this title may be utilized provided all other requirements of the zone are met. The Planning Director may waive lot frontage and lot area requirements on platted lots, platted prior to this provision, by not more than five percent (5%) of the requirements of this title. Parcels subject to this exception are subject to Title 16 requirements. Any use of premises or building which deviates from or violates any of the provisions of this title shall be termed an illegal occupancy and the persons responsible therefore shall be subject to the penalties provided herein. Corner lots or parcels in all residential zones and fences, walls, and retaining walls on property lines shall provide and maintain a vision clearance area. A "vision clearance area" is defined as a triangular area formed at a corner lot or parcel by the intersection of the street curb and a straight line joining said lines through points fifteen (15) feet back from their intersection. See Diagram “A” – 17.04.090. The vision clearance area shall provide an area of unobstructed vision from three and one-half (3 1/2) feet to eight (8) feet above the top of the curb at the side of the vision clearance line intersection with the curb having the lower elevation. Natural topographic features, utility poles, and tree trunks are excluded from this requirement. 1. It shall not give the appearance of a business. 2. It shall not change the character of the dwelling. 3. There shall be no display, except by a non-illuminated sign no larger than one (1) square foot. 4. No more than one assistant shall be employed on the site. 5. There shall be no increase in noise outside the dwelling unit. 6. There is only a minor increase, if any, in traffic traveling to and from the dwelling unit. 17.04.110 Bed and Breakfast Facilities. Bed and Breakfast facilities are permitted in the Urban Standard Density Residential (R-2), Urban High Density Residential Zone (R-3), Office/Residential Zone (C-1), and General Commercial Zone (C-2). 1. Applications: Applications for Bed and Breakfasts Permits shall be accompanied by a plot plan drawn to scale indicating the location of existing or proposed structures, number of guests or bedrooms, and location of the required off-street vehicle parking. 2. Review: Where permitted, Bed and Breakfast facilities are permitted outright as accessory uses, and as such shall be processed as administrative actions, per the Administrative Actions provisions (Section 17.09.030), and approved, approved with conditions, or denied by the Director. 1. The structure shall retain the characteristics of a single-family dwelling. 2. The number of guestrooms shall be limited to five (5). The number of guests shall be limited to ten (10). 3. In addition to required off-street parking for the residential use, one (1) hard surfaced off-street parking space shall be provided for each bed and breakfast guestroom. Parking areas shall not be located in the front yard. Parking areas may be adjacent to the Bed and Breakfast establishment. Alternative parking plans that meet the requirements of this chapter may be approved by the Planning Director. 4. Signs shall be limited to one (1) non-illuminated sign not exceeding one and one-half (1½) square feet. No off-premises signs are permitted. 5. A bed and breakfast facility shall be subject to the Hotel Tax pursuant to Chapter 5.09 of the Hood River Municipal Code. Where a morning meal is provided as part of the guest room charges, the hotel tax will be imposed on eighty percent (80%) of the rent charged by the bed and breakfast operator. 6. A bed and breakfast facility shall be subject to approval by the County Health Officer, the City Fire Marshal, and the City Building Official. 7. The bed and breakfast facility shall be owner or manager occupied. C. Time Limit. A bed and breakfast facilities permit is valid for a period of two (2) years from the written notice of the final decision, or the decision on an appeal, whichever is later. 17.04.115 Hosted Homeshares and Vacation Home Rentals. Dwelling units may be used as hosted homeshares of vacation home rentals in the Urban Low Density Residential Zone (R-1), Urban Standard Density Residential Zone (R-2), Urban High Density Residential Zone (R-3), Office/Residential Zone (C-1), and General Commercial Zone (C-2). 1. Persons operating a hosted homeshare or vacation home rental shall obtain a short-term rental operating license pursuant to Chapter 5.10 of the Hood River Municipal Code. B. Use Restrictions – All Zones. 1. The room(s) for transient rental shall not include rooms within a recreational vehicle, travel trailer, or tent or other temporary shelter. Rooms within a detached or attached accessory dwelling unit are subject to HRMC 17.23. 2. The maximum occupancy for the dwelling shall be two persons per bedroom plus two additional persons. For example, a two-bedroom dwelling would have a maximum occupancy of six persons. 3. One (1) hard surfaced off-street parking space shall be provided for every two bedrooms. In calculating the number of spaces required, the total shall be rounded up. Parking areas shall not be located in the front yard. If the garage is to be utilized to meet the parking requirement, a photo of the interior of the garage shall be submitted to show the garage is available for parking. Required parking may be permitted on another lot within 250 feet of the subject property with a shared parking agreement or proof of legal parking access. 1. A hosted homeshare or vacation home rental is only permitted when it is an accessory use to the existing and continued residential use of a dwelling as the primary residence of the property owner. Proof of primary residence shall be provided in accordance with Chapter 5.10 of the Hood River Municipal Code. 2. The accessory use of a primary residence as a hosted homeshare or vacation home rental is limited to a total of ninety (90) days per calendar year. D. Prior Existing (Nonconforming) Use. For purposes of hosted homeshare and vacation home rentals, the nonconforming use provisions in HRMC Chapter 17.05 (Nonconforming Uses and Structures) shall apply except as specifically modified in this section. a. Until 5 years from the adoption date of this ordinance, at which time use of the property shall come into compliance with the parking requirements in 17.04.115(B.3). b. Until 7 years from the adoption date of this ordinance, at which time use of the property shall come into full compliance with the then-applicable provisions of this HRMC Title 17.
c. The owner actually paid a Hotel Tax to the City pursuant to HRMC Chapter 5.09. 3. The proponent of the nonconforming use status of a hosted homeshare or vacation home rental has the burden of proving by a preponderance of credible evidence all of the elements of a nonconforming hosted homeshare or vacation home rental. 4. In addition to proving the elements of a nonconforming hosted homeshare or vacation home rental as described in subsection D2 of this section, to maintain that status, the owner shall apply for and obtain a Short Term Rental Operating License under HRMC Chapter 5.10 within 12 months of the effective date of Ordinance 2026, which is October 13, 2017, and maintain in good standing that License for the remaining duration of the amortization periods provided in this section. Failure to maintain the Short Term Rental Operating License in good standing for the remaining duration of the amortization periods shall result in the immediate termination of any nonconforming use status the home may otherwise have had by operation of law and without the need for any action by the City. The non-conforming use status provided for herein does not transfer with title to the property. 5. A valid non-conforming hosted homeshare or vacation home rental under this subsection D may be nonconforming with regard to subsection 17.04.115(B3, C1 and C2) requirements provided that the extent of the non-conformity with subsection C2 is limited to the maximum number of nights of transient rental which previously occurred in any one of the following calendar years: 2013, 2014, 2015 or 2016 to the effective date of this ordinance. 6. In the event that the amortization periods provided for herein are insufficient compensation for a property owner to recoup his or her reasonable investment in the property’s actual use as a lawful transient rental (i.e., hosted homeshare or vacation home rental) or imposition of these regulations results in a demonstrable reduction in the property’s fair market value, such a property owner may apply for and seek additional or other compensation from the City under ORS 195.310 to 195.314. Such a property owner may also provide documentation of the owner’s reasonable investments in the nonconforming use of the property exclusively for its use as a transient rental that exceed the value that can be recouped by continued transient rental use of the property for the amortization periods and which cannot be put to any other economically viable use of the property. If the property owner demonstrates with credible evidence a reduction in fair market value or that the owner’s reasonable investment in the property as a lawful transient rental is not recouped by the amortization periods provided for herein, the city may provide additional compensation in a form and amount of its choosing. The property owner may appeal any such final determination pursuant to ORS 195.318. 1. Lot Coverage: The percentage determined by dividing (a) the area of a lot covered by the total (in square feet) of: (1) the footprint of the main building; and (2) the footprints of accessory buildings (counting only buildings with footprints larger than one hundred fifty (150) square feet, or with two stories or more); and (3) parking pads and driveways ; by (b) the gross area of the that lot. 2. Main Building Footprint Coverage: The percentage determined by dividing that area covered by a main building footprint by the gross area of the lot on which the main building is located. The main building footprint includes all parts of a main building that rest, directly or indirectly, on the ground, including, by way of illustration and not by limitation, bay-windows with floor area, chimneys, porches, decks supported by posts and with floor heights that are four (4) feet or higher above grade, cantilevered decks with horizontal projections that are four (4) feet or more, and covered breezeways connected to a main building. B. Coverage: Maximum lot coverage applies to any residential dwelling lot in the “R” and “C-1” zones for all existing structures and new construction, except as provided below. Maximum lot coverage for residential dwellings is as shown in the table below. 1. When a detached garage is provided in the rear yard, the maximum lot coverage may be increased as shown in the table below. 2. When a porch is attached to the front elevation of the residential dwelling and has an area of at least sixty (60) square feet on the front of the building (exclusive of any wrap-around or side porch), the maximum coverage may be increased as shown in the table below. 3. Existing main and accessory structures that are not in conformance with these coverage requirements on September 1, 2006, are permitted to be rebuilt within the building footprint as it existed on September 1, 2006, if the structures are damaged or partially destroyed by fire, wind, earthquake or other force majeure and if construction commences within two (2) years from the date of the calamity. 4. Multi-family dwellings are exempt from the lot coverage requirements. 17.04.130 General Requirements for Parking Lots. 1. Areas used for standing or maneuvering of vehicles shall have hard surfaces maintained adequately for all-weather use and be so designed as to avoid flow of water across sidewalks. 2. Access aisles shall be of sufficient width for all vehicular turning and maneuvering. 3. Service drives to off-street parking areas shall be designed and constructed to facilitate the flow of traffic, provide maximum safety of traffic access, and provide the maximum safety of pedestrians and vehicular traffic on the site. 4. Service drives for parking lots shall have a minimum vision clearance area formed by the intersection of the driveway center line, the street right-of-way line, and a straight line joining said lines through points fifteen (15) feet from their intersection. Exceptions may be granted by the Building Official with the provision of safety devices. 5. Landscaping shall be in conformance with the landscape standards in this title. Duplexes are excluded from this requirement. 17.04.140 Exception to Permit Expiration. The expiration date of any permit issued under Title 16 and/or Title 17 for a low income housing project that receives federal funding, whether directly or through tax credits, and for which a deed restriction is required for each unit of affordable housing preserving the unit as affordable housing for no less than 40 years, may be automatically extended by the Planning Director, on good cause shown, for up to 2 additional 2 year periods. If the permit has already expired, the extension(s) may be granted so long as not more than 60 days have passed between the expiration date and the extension request. Extension requests must be submitted to the Planning Director in writing. The purpose of this chapter is to permit nonconformities to continue, but not to encourage their perpetuation, and to ultimately bring all uses, buildings, and structures (except certain existing residential uses) into conformance with this ordinance and the Comprehensive Plan. 1. Expansion: A nonconforming use shall not be expanded or moved to occupy a different or greater area of land, building, or structures than the use occupied at the time it became nonconforming. 2. Discontinuance: If a nonconforming use is discontinued for any reason for more than twelve (12) consecutive months, any subsequent use shall conform to all of the regulations of the subject zone. For the purpose of this ordinance, rental payments, lease payments, or the payment of taxes shall not be alone or together sufficient to constitute continuance of the use. a. Traffic: Traffic impacts generated by the use change are not increased. b. Nuisances: Noise, dust, and any other nuisance conditions are not increased. 1. The structure is not enlarged, moved, or altered in a way that increases its nonconformity; however, the structure may be altered to decrease in nonconformity. 2. If a nonconforming structure is damaged by any means, the structure may only be reconstructed or replaced to conform to its pre-damage nonconforming state. Otherwise, the structure shall be reconstructed in accordance with the provisions of this ordinance. 3. If a nonconforming structure is moved, it must conform to the standards of the zone to which it is moved. 1. The maintenance or repair conforms to the existing nonconforming structure. 2. The proposed maintenance or repair does not enlarge, move, or alter the structure in a way that increases its nonconformity. 3. The proposed maintenance or repair is not prohibited on the deed. 1. Rebuilt if damaged or destroyed for any reason, provided the reconstructed building has the same or fewer number of residential units, and serves the same use as the original structure. 2. Continued for residential use whether or not the structure is continuously occupied, provided that the residential use is not changed to some other use. a. The structure maintains the same or fewer number of residential units. b. The setback requirements for residential dwellings are met. In cases where the structure does not meet the residential zoning setback standards, the modification or enlargement to the structure is allowed provided that any expansion does not further encroach upon the setback requirements. c. The residential off-street parking requirement shall not be reduced. d. The nonconforming structure is not located in an existing City right-of-way. e. The modification or enlargement does not exceed the allowed maximum building height. B. A nonconforming telecommunications tower that provides public emergency communications services may be moved to occupy a different area of land on the same parcel. This provision does not exempt the structure from compliance with other standards or procedures applicable to the use. A conditional use permit is a mechanism by which the city may require specific conditions of development or of the use of land to ensure that designated uses or activities are compatible with other lawful uses in the same zone and in the vicinity of the subject property. 1. Pre-application Conference: Prior to submittal of a conditional use permit, application, the applicant or applicant’s representative shall attend a pre-application conference. 2. Application: An applicant may submit an application for a conditional use permit at any time after completion of a required pre-application conference. The applicant shall submit a complete application as specified in application and plan requirements section of this chapter. 3. Quasi-Judicial Conditional Use: Applications shall be processed as a Quasi-Judicial application as set forth in the Quasi-Judicial Actions provisions (Section 17.09.040). 4. Changes: Changes to an approved or pre existing conditional use that does not increase the density or impact of the use may be approved by the Planning Director. Changes that the Planning Director determines will increase the density or impact of the use shall be referred to the Planning Commission for a public hearing in accordance with the provisions of this chapter. Prior to review, a plan showing the desired changes must be submitted to the Planning Department. 5. Change in Use: As used in this chapter, change in use shall include, at a minimum, expansion of the use, expansion or alteration of the structure or developed area, change in the functional nature of the use, and/or change in the type of use. A. An application for a conditional use permit shall be submitted by the owner of the subject property, or shall be accompanied by the owner's written authorization, on a form prescribed by the City and accompanied by the required filing fee. The application shall include a plan or drawing meeting the requirements below and a narrative explaining how the applicable criteria are satisfied or will be satisfied through conditions. 1. Dimensions and orientation of the parcel. 2. Locations and heights of buildings and structures, both existing and proposed. Scaled elevation drawings and photographs shall be required. 3. Location and layout of parking and loading facilities, including bicycle parking required pursuant to 17.20.040. 4. Location of points of entry and exit and internal circulation patterns for vehicular and non vehicular traffic in compliance with the requirements of Chapter 17.20. 5. Location of existing and proposed wall and fences and indication of their height and materials. 6. Proposed location and type of exterior lighting. 7. Proposed location and size of exterior signs. 8. Site specific landscaping, including percentage of total net area. 9. Location and species of trees greater than six (6) inches in diameter when measured four (4) feet above the ground, and an indication of which trees are to be removed. 10. Topographic map of the subject property using two (2) foot contour intervals (five (5) foot contour intervals may be allowed on steep slopes). 11. Natural drainage and other significant natural features. 12. Legal description of the lot. 13. Percentage of the lot covered by all proposed and remaining structures, to include asphalt concrete and Portland Cement Concrete. 14. Locations and dimensions of all easements and nature of the easements. 15. Service areas for uses such as loading and delivery. 16. Grading and drainage plan. 17. Other site elements that will assist in evaluation of the proposed use. 18. A brief narrative on the nature of the activity shall accompany the site plan including the number of employees, the method of import and export, the hours of operation including peak times, and plans for future expansion. A conditional use shall be granted if the Planning Commission finds that the proposed use conforms, or can be made to conform through conditions, with the following approval criteria. For purposes of this chapter, the surrounding area includes all property within the applicable notice area for a use. In addition, any property beyond the notice area may be included in the surrounding area if the hearing authority finds that it may be adversely impacted by the proposed use. a. Any harmful effects on desirable neighborhood characteristics and livability. b. Bicycle and pedestrian circulation, access and safety. 3. Nuisance: The use shall not generate significant off-site nuisance conditions including, but not limited to, noise, glare, odor, or vibrations. 4. Plan Consistency: The proposal shall be consistent with the Comprehensive Plan and the requirements of the Zoning Ordinance. 5. Scale: The site must be physically capable of accommodating the proposed use, including any needed landscaping, parking, and other requirements. The building size, shape, and/or location may be changed if needed to assure the physical capability of the site. 6. Transportation: Adequate transportation facilities are available to serve the conditional use in terms of the function, capacity, and level of service identified in the Transportation System Plan (TSP). 7. Landscaping: Landscaping shall be in conformance with the landscape regulations of this title. 8. Performance Bonds: When needed to ensure performance of special conditions, bonds or other acceptable securities shall be required. 9. Burden of Proof: The applicant shall bear the burden of showing how the proposed use does conform or can be made to conform through conditions. 10. Final Plans: If the conditional use is approved, detailed final plans shall be submitted which indicate conformance to the conditions. The final plans shall be subject to approval by the City. Final decisions on conditional use permits may be appealed in accordance with the Appeal Procedures (Section 17.09.070) of this ordinance. 17.06.040 Time Limits on a Permit for a Conditional Use. The conditional use permit is valid for a period of two (2) years from the written notice of the final decision, or the decision on an appeal, whichever is later. A single one (1) year extension may be granted by the director prior to the expiration date if the applicant can demonstrate that circumstances or conditions, not known or foreseeable at the time of original application, warrant an extension of the permit. The extension request must be received by the department no later than thirty (30) days prior to the expiration of the permit. No conditional use application shall be considered by the Planning Commission within a six (6) month period immediately following a previous denial of such request. An application may be denied without prejudice and a waiver of the six (6) month restriction granted. If conditions have changed to an extent that further consideration of an application is warranted, the hearing body, on its own motion, may consider new evidence and waive the six (6) month restriction. A. Any conditional use permit shall be subject to denial or revocation by the Planning Commission if the application includes or included any false information, or if the conditions of approval have not been complied with or are not being maintained. B. In order to consider revocation of a conditional use permit, the Planning Commission shall hold a public hearing as prescribed under Review Procedures (Chapter 17.09) of this title in order for the holder of a conditional use permit to show cause why the permit should not be revoked. C. If the Planning Commission finds that the conditions of approval have not been complied with or are not being maintained, a reasonable time shall be given for making corrections. If corrections are not made, revocation of the conditional use permit shall become effective ten (10) days after the time specified. D. Reapplication for a conditional use which has been revoked cannot be made within one (1) year after the date of the Planning Commission's action, except that the Planning Commission may allow a new application to be considered if new evidence or a change in circumstances warrants it. E. Abandonment of the use for over twenty-four (24) consecutive months shall void the conditional use. A single one (1) year extension may be granted by the director prior to the expiration date if the applicant can demonstrate that circumstances or conditions, not known or foreseeable at the time of original application, warrant an extension of the permit. The extension request must be received by the department no later than thirty (30) days prior to the expiration of the permit. If part of the conditional use is still being utilized, an additional conditional use will need to be obtained in order for expansion of the use.